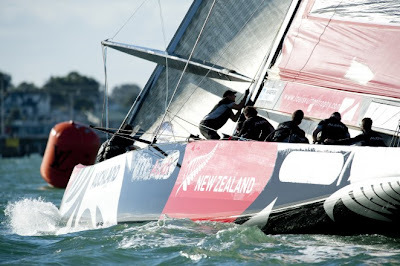 American-based Kiwi Gavin Brady and his largely international team of Latin Rascals took the fight to host Emirates Team New Zealand in their Louis Vuitton Trophy race today, only to lose after a gear failure. Brady, with American tactician Morgan Larson calling the shots, pulled off a risky pre-start strategy against skipper Dean Barker on the New Zealand boat, pushing ETNZ deep into the start box after a dialup but breaking clear with immaculate timing to grab the start he wanted – a port tack cross at speed, right at the committee boat. Minutes later as they came back together, Brady had a two boat-length advantage that he parlayed into a 22 second lead at the first weather mark. Down the run, the New Zealanders split away and Brady let them go, only to concede the right side of the course when they rounded opposite gates starting the second beat. Out on the Waitemata Harbour today, the wait for a good breeze stretched out to three hours but the competitors were rewarded with superb sailing conditions under a bright sunny sky. The sea breeze filled in from the southwest, starting at five to seven knots and building during the afternoon to nearly 15 knots before softening a little in the late afternoon. The boats raced on 1.2-mile legs on the black course, bounded by the Devonport shore and the natural grandstand of North Head on one side and Bastion Point on the other. Spectators high on North Head were rewarded with birds-eye views of the competition.